The Mater Private Hospital is the biggest hospital of Mater Health Services. Its main strengths are the long tradition and good reputation due to a high healthcare quality. The focus on high quality is also positioned in its vision to become the leader of compassionate and exceptional healthcare. Currently, reaching the vision is at risk. Due to a poor work-life balance the job satisfaction as well as motivation of nurses decreased. In addition, high stress levels lead to a poor nursing outcome and impair the healthcare quality. Furthermore, an increasing turnover rate causes lowered organisational cost efficiency and high recruitment costs. An internal and external analysis of the labour market, the MPH, and the role of nurses, showed the great importance of a good WLB, a high commitment and a high retention rate. Since one of MPH’s main goals is to continually improve its employment offer in order to increase the retention rate, it is recommendable that it implements an intervention that increases the WLB, job satisfaction and retention rate. Two possible interventions have been examined: (1) Flexible Working Hours and (2) Mentoring Programme. The recommended intervention for the MPH is implementing a Mentoring Programme. It shows the same advantages in its outcome as the flexible working hours (higher job satisfaction, better WLB, higher commitment). 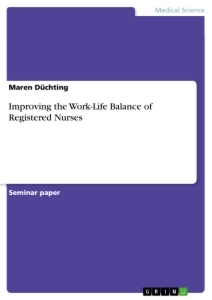 However, it has more advantages than flexible working hours: it also improves older nurses’ retention, improves the team environment, and improves the knowledge and education of younger nurses. Therefore, it contributes to achieve the MPH’s vision by increasing the healthcare quality. A generated action plan, including key actions, success criteria, timescales, resources, responsibilities, monitoring and evaluation against success criteria shows a detailed implementation strategy. After the implementation it is recommendable according to the CHRM framework to continually assess and improve the mentoring programme. The following report recommends the Mater Private Hospital (MPH) intensive care unit (ICU) to implement a mentoring programme. It will not only improve registered nurses’ (RNS) work-life balance (WLB) and increase the retention rate but also improve the RNS’ education and therefore increase the likelihood of achieving the MPH vision. The MPH belongs besides several hospitals and health centres to the Mater Health Services. It is the biggest of Mater Health Services’ hospitals with over 328 beds, and 96,623 patient days in 2014 (Mater Health Services 2014). In order to take care of the high number of patients, to meet the patients’ expectations and maintain the good reputation, the MPH has a great need of a large number of highly committed and qualified nurses. The current issues of bad working conditions and poor WLB are severe weaknesses of the MPH. Increased stress and lowered motivation among the RNS can negatively affect the patient care and therefore the MPH’s reputation (Appendix 1). Furthermore, increased absenteeism- and turnover rates cause high replacement and recruitment costs. To maintain the good reputation, reduce costs and therefore stay competitive the MPH has a great need for an intervention that improves the nurses’ WLB and consequently increases motivation, commitment and the retention rate. The methodology is based on the CHRM decision-making framework (Härtel & Fujimoto 2010). To perform the six steps, two different approaches have been applied. Firstly, an environmental analysis generated a SWOT and GAP analysis (Step 1) (Appendix 1; Appendix 2). Therefore, the MPH’s needs, and possible risks could be figured out (Step 2). Secondly, a literature review resulted in and assessed two possible interventions (Step 3). In consequence one intervention was chosen and an implementation action plan, including success and against success criteria, was developed (Step 4-6). The report contains two main limitations. Firstly, the access to MPH’s data was limited. Therefore, an overall and in-depth data analysis was not possible. Secondly, the report does not focus on possible costs of the interventions. In order to get an in-depth understanding of the main issue of a high turnover rate due to bad working conditions, a detailed external (labour market) as well as an internal (Mater Private Hospital) analysis is required. Additionally the role of RNS is examined to understand nurses’ needs and their importance for the MPH. Australia faces an overall shortage of nurses (Dawson et al. 2014; Appendix 1). Taking into consideration that the demand for nurses increased between 2001 and 2011 with an upward trend the shortage signifies a severe issue to the health care sector (ABS 2013). Therefore, hospitals are going to have increasing issues when recruiting highly qualified nurses (Appendix 1). Implementing a mentoring programme or flexible working hours can result in both attracting applicants and retaining employed nurses. Thereby, the risk of having an insufficient number of nurses is lowered, and the MPH can avoid high costs interrelated to recruiting. Another issue is the ageing workforce (Jackson & Daly 2004; Buchan & Aiken, 2008; Appendix 1). In 2011 one third of Australian nurses was 50 years or older. Regarding the data from 2001 the ageing process within the workforce also shows an upward trend (ABS 2013). Due to the increasing age the risks of health issues among the workforce increase. In order to avoid early withdrawals from the workforce or early retirements due to health issues the MPH is demanded to implement health-promoting measures and prevent stress or fatigue that could negatively affect the state of health. Flexible working hours or mentoring programmes can avoid health affecting working conditions. Thereby, high recruitment costs can be avoided and experienced nurses and their knowledge retain in the MPH. Two of MPH’s main strengths are a long tradition, and a good reputation (Appendix 1). MPH’s vision is to become the leader of compassionate and exceptional healthcare (Mater Health Service 2014). The current issues regarding RNS can have severe impacts on the vision. High turnover rates across nurses affect the nursing care outcomes and therefore the quality of healthcare (Hayes et al. 2012; Appendix 2). Furthermore, it causes high financial losses. A nurse’s withdrawal results in costs estimated between $42,000 and $64,000, including separation, recruitment, and replacement (Barton, Gowdy & Hawthorne 2005; Hayes et al. 2012). Due to high stress levels, a poor WLB, and high turnover rates the MPH has to face many negative effects like lowered job satisfaction, decreased nursing quality, decreased efficiency, increased error rates, unsatisfied patients, and therefore a damaged reputation (Hayes et al. 2012). To achieve the vision, increase the organisational cost efficiency, and fulfill the self-defined goal to continually improve the employment offer the MPH has to implement an initiative that improves the WLB and the retention rate (Appendix 2). Although the number of nursing students has increased since 2001, many young nurses decide to transfer to another organisation or change their profession due to bad or overstraining working conditions (Barton et al. 2005; ABS 2013; Dawson et al. 2014). Australian nurses are confronted with high physical, mental, and emotional demands since they are responsible for the patient care and patients’ wellbeing (Birks et al. 2013). Although nurses have a great responsibility their wages are relatively low (ABS 2013; Deans 2014). Work-life strains are often caused by shift work since it affects nurses’ psychological, physiological health, and their social lifes (Grzywacz et al. 2006; Perrucci et al. 2007; Skinner et al. 2011). Especially the high number of female nurses (90% in 2011) with children struggle (ABS 2013). It can be seen in a higher absenteeism rate during school holidays. Many RNS are confronted with stressful situations, e.g. aggressive patients (Deans 2014). Moreover, they experience many traumatic incidences, e.g. deadly diseases, dolour or despair which can lead to psychological stress (Honkavuo & Lindström, 2014). Another stress factor is the strong social commitment. Many nurses put others’ needs and interests above their own. Consequently, their WLB is affected and their stress level rises (Mullen 2015). Therefore, it is the MPH’s responsibility to provide initiatives that create a WLB. To improve the WLB and therefore to increase the retention rate, two interventions are possible: (1) Flexible Working Hours and (2) Mentoring Programme. There are different types of flexible working hours. The model that should be applied in the MPH includes temporal flexibility and a re-arrangement maintaining the total amount of working hours (Costa & Sartori 2005). One of the main reasons why nurses’ work-life balance is negatively affected is the working time (Skinner et al. 2011). Shift and night work was found to cause health problems, and issues in social lifes (Costa & Sartori 2005). Firstly, it results in sleep disturbances, and fatigue which does not only have impacts on nurses’ wellbeing but also on the organisation since it increases the risk of errors (Costa & Sartori 2005). Secondly, due to night, weekend and holiday shifts the social life of nurses can be highly impaired as the interaction to family and friends is affected (Grzywacz et al. 2006; Perrucci et al. 2007). Studies have shown that not the duration but the arrangement of working hours causes issues, and high stress levels (Barnett 2006). Work Life Balance Movement in the U.S.
How a Basic Research is Conducted and Evaluated. How Policies and Strategies are used to Improve Work Place Moral and Potential of Staff. Are Familiy Friendly Policies (FFP) a challenge for organisational structures or just a 'play around the margins'?